The shaver system offers unmatched power and cutting power and precise control of blade speed from an ergonomically design foot-switch. Multiple hand-piece option are available for arthroscopy and endoscopic sinus surgery procedures. There are many state-of-the art blade designs straight, curved, rotating, mini & irrigating for tissue resection and burrs for more efficient bone debridement. When used along with the Arthromat fluid management system and camera the operative field is clear and details well visualized. Online setting allows online increase and decrease of set speed. Variable modes forward, reverse & oscillating modes. Attached blades easy blade fitting and removing in the hand piece. Foot switch foot switch easy foot control in variable blade modes (forward, reverse & oscillating). Shaver hand piece with cord fully autoclavable. Suction control inbuilt in hand piece. Power supply 230V (AC) / 50 Hz +/- 10%. In built voltage control rectifier. 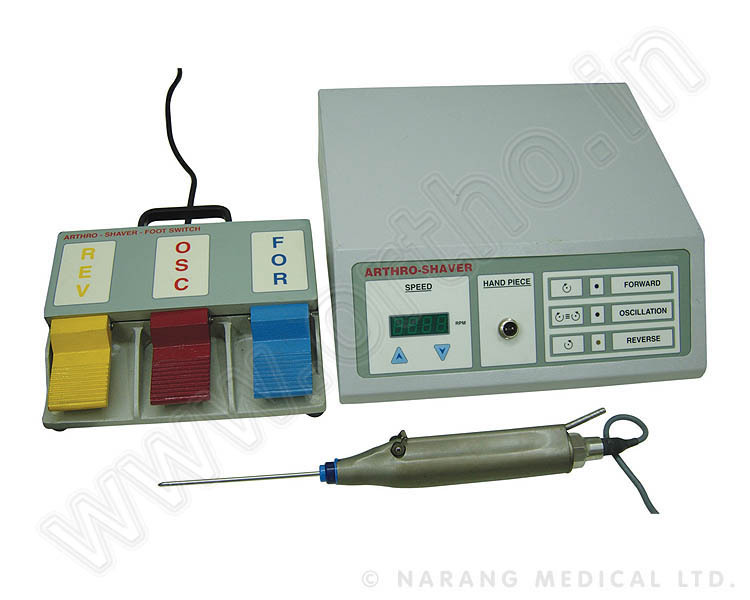 Foot switch, Tubing set, inflow outflow cannula. Brush set, Cleaning oil, Power cord & Fuse.